Although no particular data is available on the Margaret, she is representative of Connecticut’s important maritime history. Seaports such as Mystic have been active in the shipbuilding, fishing, and whaling industries for hundreds of years. The Mystic River specifically has most likely been the scene of shipbuilding since the 1600s. More than 600 vessels are known to have been constructed on its shores between 1784 and 1919. In the early 19th century the small village of Mystic had become a significant fishing and whaling port, sending out as many as four whale ships annually. After that era, the shipbuilding industry’s importance quickly overtook the importance of fishing or whaling. However, all along the Connecticut coast whaling continued to play a notable role in the state’s economy. 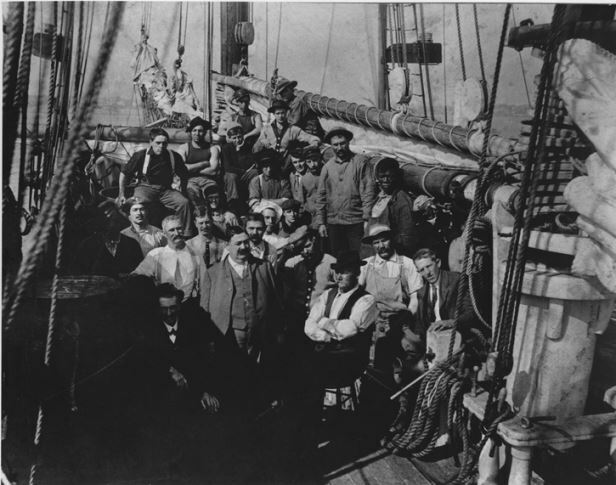 By the time this photograph was taken in the early 20th century, the whaling industry was sharply declining due to a variety of factors. The discovery of petroleum (kerosene), and later electricity, replaced the demand for whale oil to use in lamps. Also the loss of a great number of whaling ships in the Civil War and various arctic disasters were discouraging. In addition, there were clearly a declining number of whales in accessible waters. Because of the combination of these factors, the industry quickly lost its influence.